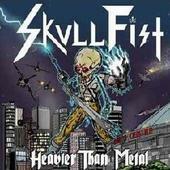 Skull Fist's "Heavier than Metal" is true old school metal in the vein of Grim Reaper, Cirith Ungol and really early Motley Crue. If you're into that era of metal, you won't be disappointed here. There are only five tracks on this EP, which is too bad, because you'll be wanting more as soon as you've listened all the way through the first time. Thankfully, all five are killer tracks and feature some chugging riffs and razor leads. Jackie Slaughter's vocals are reminiscent of Grim Reaper's Steve Grimmett and Cirith Ungol's Tim Baker. In other words, they're those piercing high-pitched vocals that cut to the very quick of your soul and that fit the music perfectly. Sure, the cheese level may be a little high here but that's a good thing in this case! You wouldn't want a dose of this metal any other way! Great album from this Canadian band and I very much look forward to hearing more. For more information, check out http://www.myspace.com/skullfisted.